One of cookery author Sophie Miller’s first memories is cooking with her mother and grandmother. “I have always loved cooking and watched my mother making her wonderful creations from a very young age. I wrote my first recipes for my sister when she went to college and needed some easy recipes she could make herself out in the big bad world.” Sophie eats a gluten-free diet, which she mostly makes from her own vegetable patch, and she loves to cook and bake vegan goods for her best friend. Here she talks about her passion for food and how to eat healthy and gluten-free the easy, non-bland way. “There are many benefits to gluten-free cooking. Reducing the intake of processed foods and replacing them with wholesome, natural ones helps with sensitivities/allergies/intolerance by alleviating or eliminates physical and mental symptoms. In my case, gluten was causing severe bloating and affecting my digestion. I found that my sleep pattern improved immensely when I stopped eating wheat, and I also noticed I had more energy and no discomfort after eating. The benefits of a gluten-free vegan diet are the same as gluten-free, but you are eliminating any animal product, including dairy. I am not vegan but, after researching causes of congestion and constant flu-like symptoms, I came across studies claiming about 75 percent of the world’s population is genetically unable to digest milk and other dairy products properly. Other studies also mentioned dairy as an instigator in congestion and flu-like symptoms. 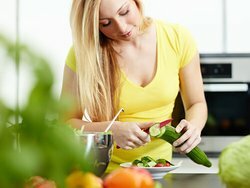 Having suffered with sinus and congestion problems for as long as I can remember, I decided to reduce the amount of dairy I was consuming, and started this process by changing from cow’s milk to unsweetened almond milk while also eating more fresh vegetables and fruit, which is essential to a raw food diet. Sophie has published more than 30 books with more in the pipeline, including a Queen Bee’s Kitchen Collection Cookbook she hopes to release this summer. “I constantly look up different types of recipes, especially gluten-free ones, as I have been wheat free for two years now. I re-create recipes to make them wheat and gluten-free but also bland-free!” See these on her food blog. Sophie lives in the country with her husband, six dogs, two horses and six chickens! Posted in FoodTagged books, interviewsBookmark the permalink.